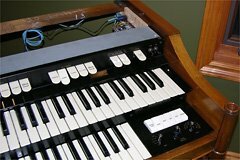 When I purchased my 1962 Hammond M-111 organ back in 2008, it was a vast improvement over my mid-1970s Yamaha BK-20B. The drawbar controlled tonewheel sound, augmented by the warmth of the vacuum tube amplifier, made the Yamaha pale in comparison. There was one feature of the BK-20B that I sorely missed though, and that was the rhythm generator (also known as a drum machine). My sense of musical timing is terrible, but I wanted more than just a simple metronome, so I set out to design one that would be suitable for my Hammond spinet. Twenty-first century drum machines use a microprocessor both to determine the rhythm, and play back recorded samples of actual instruments to generate the percussion sounds. In comparison, analog drum machines from the 1970s typically used transistor and diode based control logic for the rhythms, and analog transistor circuitry to produce percussion-like sounds. The rhythm generator in my Yamaha BK-20B could generate eight different rhythms, using a palette of seven synthesized percussion sounds (bass drum, snare, cymbal, hi-hat, high conga, low conga, and high bongo). More advanced drum machines such as the Roland TR-77 or Hammond AutoVari-64 could produce more percussion sounds, and more rhythms, along with a number of variations of each one. In the process of designing Retronome, I studied the circuitry of several 1970s commercial offerings. 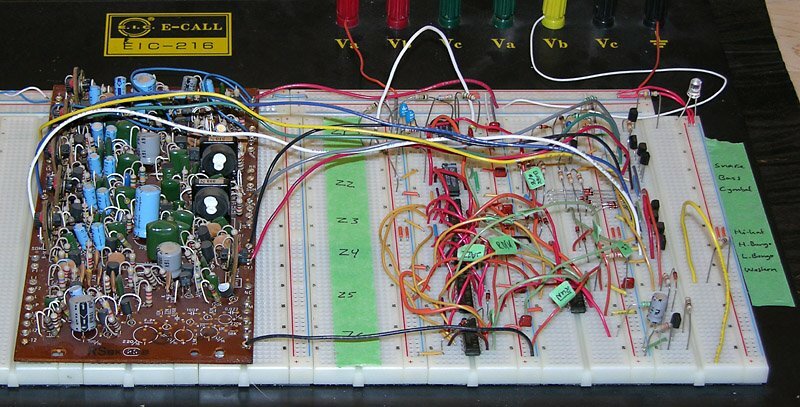 One thing that virtually all had in common was a large diode array used as a read-only memory (ROM) to store multiple beat patterns for each instrument. Selecting a rhythm would cause one or more patterns and their corresponding instruments to be combined to produce the requested rhythm. I went through many possible designs based on these older methods, including one where the diode ROM was replaced by an EPROM chip, and another where there was a separate instrument-select switch for each point in a rhythm. 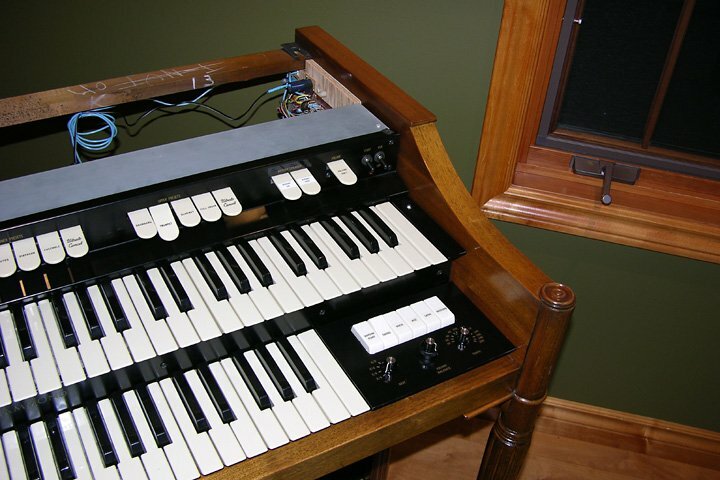 I eventually settled on a design half way in between, which I felt matched the Hammond organ philosophy very well. Much like a Hammond organ lets one combine individual harmonics to produce a sound (as opposed to the presets-only approach of other electronic organs), I devised a rhythm pattern generator that lets the organist select the individual percussion sequences separately. Thus one can add to or subtract from a rhythm just as one might adjust the drawbar settings to change the character of tone produced. Time signature: Selects 1/4, 2/4, 3/4, 4/4, or 6/8. Volume: Controls rhythm volume independent of the rest of the organ. Balance: Pans between “tone” instruments (bass drum, bongo, conga) and “noise” instruments (snare, cymbal, hi-hat). Tempo: Adjusts from 40 to 208 quarter-note beats per minute. The five position time signature switch together with the five patterns which can be selected in any combination can produce 144 different rhythms (not 160 because the Swing fill has no effect at the 1/4 setting). Breadboarded Retronome prototype. Yamaha percussion sound board is on the left. Rhythm pattern generator is on the right. To avoid propriertary parts or custom programmed chips, I chose to implement all the rhythm pattern generating logic with TTL/LS integrated circuits. These are readily available and I happened to have all the chips I needed on hand. With the rhythm logic design out of the way, the remaining issue was how to generate the actual percussion sounds. Most of the 1970s analog designs made use of hard-to-find inductors (coils), so I began designing op-amp based circuits requiring only resistors and capacitors. After several false starts, I realized that the percussion sound generation circuitry from my BK-20B was on its own circuit board, and that it would be possible to interface this with my rhythm logic, so I took the easy way out. If you want to replicate this project, you’ll have to find a percussion sound board from a Yamaha organ. Fortunately that’s not hard to do since many of these old organs are being thrown out, given away, or sold very cheaply. 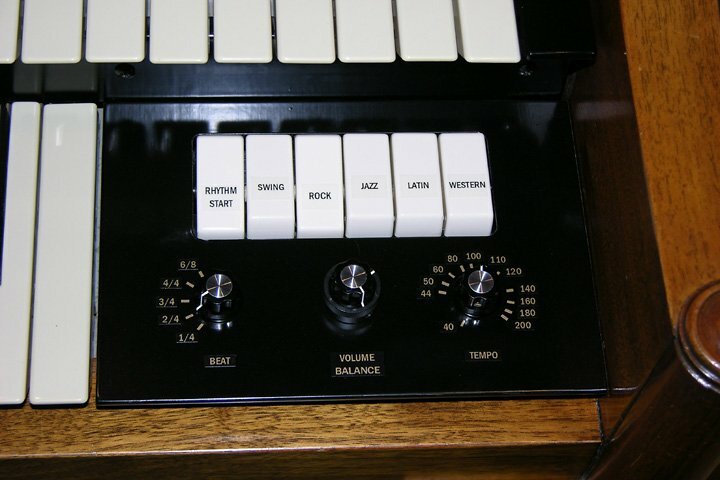 Most of the Yamaha Electone series of analog organs used the same percussion board. For those who can’t find such a board and want to build one from scratch, I’ve included the schematic in this article. The rhythm pattern generator is implemented with a single 555 timer IC and six standard TTL/LS integrated circuits. Some diodes are used to provide additional logic. Retronome rhythm pattern generator logic circuitry. Although this is probably the most complex circuit appearing on this web site, it is fairly straightforward if one examines it one piece at a time. Z1 is a 555 timer wired as an astable oscillator in the typical configuration. The only unusual feature is capacitors C2A and C2B, which are wired in parallel to achieve the desired capacitance. The goal was to achieve the standard metronome tempo range of 40 to 208 beats per minute. Since the rhythm pattern generator produces a beat every four clock pulses, the timer needs to produce 160 to 864 pulses per minute, corresponding to a frequency range of 2.67 to 14.4 Hz. By designing for a range of 2.5 to 16 Hz, the desired range will be achieved, even allowing for component tolerances. Tempo control R2 should be a reverse logarithmic taper potentiometer if possible, so that the higher tempos aren’t all packed into the last few degrees of knob rotation. The pulses from the timer will be about 17ms wide and active-low (the timer output is normally high, going low for the duration of the pulse). Moving to the right in the schematic, Z2 is a 74LS193 4-bit up-down counter. Z2 will increment its count at the end of each clock pulse from Z1. This means that during each clock pulse, Z2’s outputs are stable. Each quarter note beat corresponds to four counts of Z2, giving the rhythm pattern generator a resolution of sixteenth notes. The reset input of Z2 is used to terminate the count early for 1/4, 2/4, 3/4, and 6/8 beats. For example, when using a 3/4 beat, Z2 only counts from 0 to 11 instead of the full 0 to 15 count range. It is also used to stop the counter completely when the rhythm is switched off. The clock pulses from Z1 are also fed into a high-pass filter composed of D1, R5, C3, R6, and D2. This filter serves to produce slightly shorter pulses than those used to trigger the percussions sounds. These shorter pulses are over by the time that Z2 increments, so that the triggers are only produced when Z2’s outputs are stable (otherwise spurious percussion sounds could be produced). The filtered pulses control transistor Q1, which inverts them and makes them available to each instrument’s trigger transistor via resistors R8 to R14. In the absence of the rhythm logic (to be described next), every instrument would be triggered on every sixteenth note. The Basic 1 sequence is always used when the rhythm pattern generator is running. It triggers the bass drum and cymbal during the zero count of Z2. Rotary switch S1 is a 5-position two section rotary switch. Section S1A selects which basic snare pattern (Basic 2 or Basic 3) is used. S1B selects when to reset Z2 to produce the correct sequence length for the selected time signature (Reset 1 for 1/4, Reset 2 for 2/4, Reset 3 for 3/4 and 6/8, or no reset for 4/4). Switches S2 through S6 determine whether the Swing, Rock, Jazz, Latin, and Western sequences are activated. Transistors Q2 to Q8 trigger the individual sounds on the Yamaha percussion sound board by briefly grounding the appropriate trigger input. The high level pulses from the collector of Q1 are applied to the bases of Q2 to Q8 unless the corresponding sequence control signal is low at the time, either because of the decoding logic, or because the corresponding switch is off (switched to ground). The diodes at the input to each trigger transistor ensure that no current flows into the transistor’s base when the output is low. This is necessary because the low level of the trigger signal lines is about 1.4V (due to the combined effect of a 0.7V TTL low output and diodes D3 to D12). This is higher than the transistors’ 0.7V base-emitter drop. The additional diodes effectively increase the base-emitter drop to 1.4V. Switch S7 controls whether the rhythm pattern generator is running or halted. When off, the input of Z3A is pulled high through R20, making its output low and disabling Z1. Similarly, one input of Z7A is high, making the output high and forcing Z2 to a zero count. Turning S7 on lets Z1 start running and Z2 begin counting from zero. Transistor Q1 drives downbeat indicator LED1. The LED flash is very short (about 10ms), so R22 is chosen to drive the LED at 50mA to produce a bright flash. This is higher than the continuous current limit of most LEDs, but within the pulse current limit. This feature was added as an afterthought. During prototyping, I discovered that disconnecting the base of a trigger transistor from its control signal would result in a continuous sequence of whatever sound that transistor was responsible for triggering. This was because there was no longer anything inhibiting the trigger pulses from Q1. Briefly closing S8 rapidly charges C4 through R18. This allows a trigger pulse to pass through R15 and D13 into snare trigger transistor Q2, resulting in a snare hit on every pulse. Transistor Q9 discharges C4 when counter Z2 is reset, ending the drum fill sequence at the next downbeat. Resistor R19 inhibits charging of C4 by the trigger pulses themselves. As already mentioned, the percussion sound board was taken from a Yamaha BK-20B organ. The same sound board was used in the entire BK-20 series, and many other 1970s Yamaha analog electronic organs. 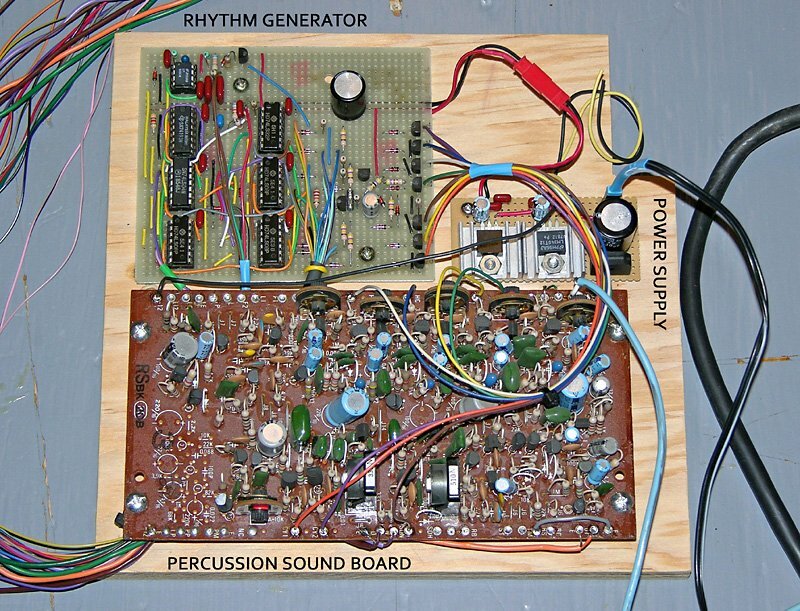 This board, marked “RS”, contains the individual percussion sound generators, balance circuitry, volume control circuitry, and a pre-amplifier. The capacitively coupled output has a level at maximum volume of about 1V peak-to-peak into 47kΩ. 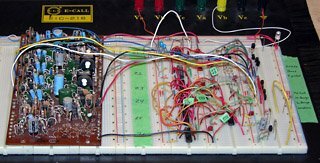 The board also contains some parts of the Yamaha’s rhythm tempo control circuitry, but this is not used in the Retronome project. For those who want to build this project and can’t obtain a Yamaha sound board, I’ve reproduced the schematic and circuit layout below (the unused tempo control has been omitted from the schematic). It should be possible to reproduce this circuit using modern transistors. Yamaha "RS" percussion sound board schematic (with notes). Yamaha "RS" percussion sound board layout. The sound board was designed to operate on negative 12VDC. At first I feared that interfacing it to my rhythm pattern generator would be a challenge, until I realized that I could operate it from a positive 12VDC supply by connecting it to the board’s “E” (earth) terminal, and the power supply’s ground terminal to the board’s “-12V” terminal. This allowed the rhythm pattern generator’s open-collector trigger transistors to directly drive the board’s instrument trigger inputs. The TTL-based rhythm pattern generator circuit operates on a 5VDC while the sound board requires 12VDC. 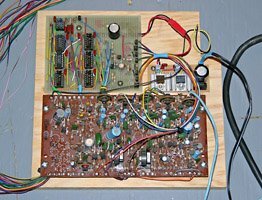 I constructed a simple linear power supply using a rectifier, filter capacitors, and 7805 and 7812 regulators, all powered by a 16VAC wall-wart. Total power consumption is under 200mA, so almost any 16 to 18VAC source will do (it will even work from 18VDC). I decided on the component layout during construction, so I did not design a detailed stripboard or PCB layout for the power supply. All I have to show here is the schematic. Unlike most other projects on this web site, I will not provide detailed construction instructions here. This is an experimenter’s project, so I’ll just briefly describe what I did and leave the details as an exercise for the reader. Retronome stripboard layout. Click to enlarge. After wiring the rhythm board, I began the tedious process of connecting wires to it to reach the switches and tempo control potentiometer on the control panel, and the trigger inputs on the percussion sound board. I also connected wires to the sound board for the volume and balance potentiometers. I constructed the power supply on a separate smaller piece of stripboard, deciding where to place the components and cut traces as I went along. 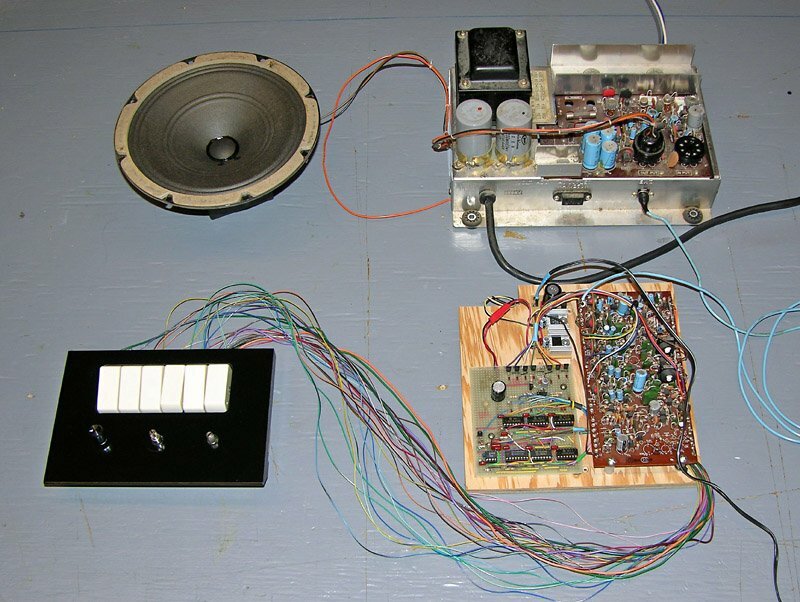 Rhythm generator, power supply, and sound board on a plywood base. I mounted the rhythm pattern generator, power supply, and sound board on a plywood base plate cut to fit on the inside right hand end of the organ, above the vibrato scanner. The notch in the board is to clear the rear top rail of the organ. 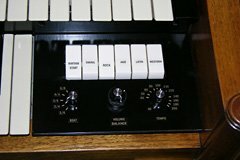 Since I built Retronome to use with my Hammond M-111 organ, I decided to integrate it into the organ. 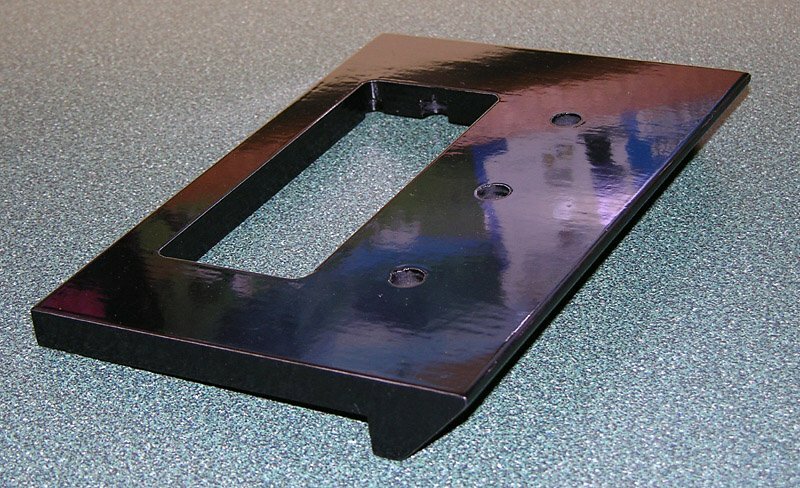 The M-100 series has a blank cheek block panel on each side of the lower manual. The one on the left is larger, but the right hand one was large enough to incorporate all the controls (and I have future plans for the left one). I considered cutting up the existing plastic (Bakelite?) cheek block to accomodate the controls, but eventually decided to build a new one from scratch instead. I was inspired by the panels from the Yamaha, which I originally thought were metal or plastic, but turned out to be plywood with an extremely fine finish. 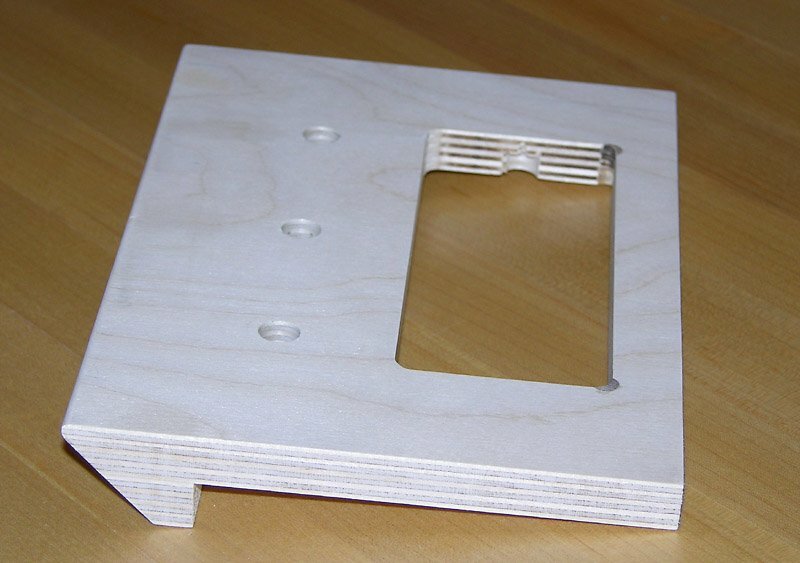 Using the existing plastic panel as a guide, I constructed a new one out of 12mm (1/2″) baltic birch plywood. Plywood cheek block panel before finishing. After two coats of primer and four coats of paint. The controls consist of six on/off switches, one rotary switch, and three potentiometers. For the switches, I used a block of tablet switches from the BK-20B, spray painted an ivory colour to match the existing switches of the Hammond. The Yamaha organ also yielded a pair of concentric potentiometers to control the volume and balance. The time signature selector was implemented using a widely available 2P6T rotary switch, using only five of the positions. The one tricky control was the tempo control. Because it linearly controls the time interval between clock pulses, it controls the rate in a reciprocal manner. Using a linear potentiometer, the higher tempos (100 to 208 bpm) ended up in the last 10% of the potentiometer’s rotation. I determined that what I needed was a 1MΩ reverse-logarithmic taper potentiometer, which took some time to find. I eventually found one at Weber Speakers (it had a switch however, meaning that about 30° of the rotation provided no change in resistance). Completed rhythm system on the bench for testing with an amplifier and speaker. After completing construction, I temporarily wired the panel to the circuitry for testing. I connected the output from the percussion sound generator to a spare amplifier (also taken from the Yamaha organ) and speaker. Everything more or less worked, except that I noticed a propensity for the circuit to skip a beat every now and then. I eventually narrowed the problem down to noise brought on by the long control panel leads. That was when I added the delay circuits consisting of R23/R24/C13 and R25/C14 to the design. Fortunately these were easy to retrofit onto the rhythm pattern generator board. Once the circuit was working properly, I determined the exact tempo at each extreme of the tempo control (by recording them to a WAV file and measuring it in Audacity). I then disconnected the tempo potentiometer from the circuit, connected it to a resistance meter, and marked the panel at the settings where the resistance matched the values I computed for various tempos approximately evenly spaced around the dial. I labeled the panel using a Brother P-touch label printer, using gold-on-black tape to label the panel for the rotary controls, and black-on-clear tape to label the tablet switches. The panel was then finished with a coat of semigloss varnish. To install Retronome in the organ, I first had to disconnect the control panel. I installed the plywood board containing the rhythm pattern generator, sound board, and power supply on the inside right hand wall of the organ, just above the vibrato scanner. The wiring to the control panel was passed through the organ to the front, at which point I could reconnect it to the panel. 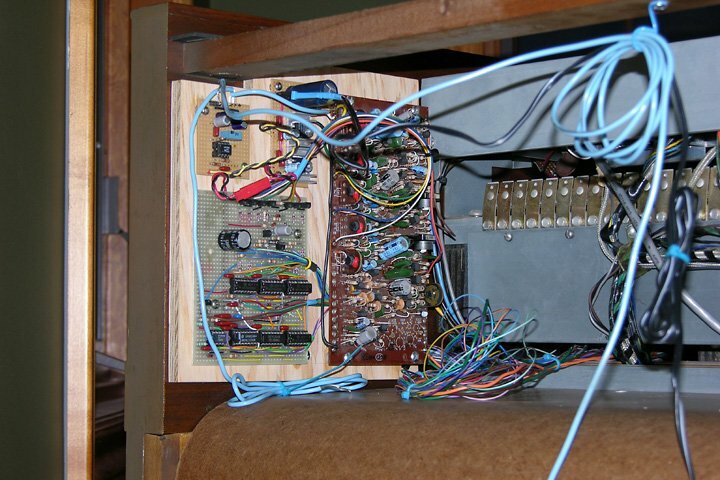 Plywood mounting board with circuitry installed on the right hand wall of the organ, with wires leading to the front. Bottom view of the control panel showing the wiring, neatly bundled and routed to the back. The Hammond M-100 series of organs has an RCA input jack on the expression pedal housing intended for connecting a record player, tape player, or 1960s phonograph (although it is labeled “RADIO/PHONO”, it does not accept a “modern” RIAA phono-level input — it expects a 0.5V audio signal). This input is compatible with the output level of the Yamaha percussion sound board, so I simply connected it there with a length of shielded cable. Completed installation before reinstalling the organ’s top panel. The downbeat LED is visible in the small cheek block next to the upper manual. Closeup of the Retronome control panel. Labeling was done using Brother label tapes. Retro-style knobs complete the project. The amplifiers in the Hammond spinet models have a very poor high frequency response. This was done intentionally to minimize keyclick. Unfortunately this also attenuates the cymbal and snare sounds, which have significant high-frequency content. I’ve modified my Hammond to have a built in rotating Leslie-like speaker, and the percussion instruments sound strange when played through this speaker, especially at the tremolo setting. I’ve decided to live with this until I’ve completed some other changes I have in the pipeline. To accomodate the rhythm generator’s power supply wall-wart, I installed an electrical outlet inside the organ, controlled by the organ’s power (Run) switch. In the not-too-distant future, I plan to build a pair of external multi-speaker tone cabinets for the organ into a wall-to-wall window seat and bookcase, with their own amplifier. At that time, I will connect the percussion sound output, and a line-level output from the organ, into a two-channel mixer which will feed the external amplifier. This means that the rhythm sounds will play only through the external speakers and will avoid the problems of playing them through the organ’s treble-attenuating amplifier and the rotating speaker. If you’ve read this far, you’re probably wondering what this thing sounds like. The following samples were all recorded with the time signature set to 4/4 and the balance control centered. Each sample consists of the basic bass-and-snare rhythm at 100 bpm. The second through sixth samples each contain one of the additional patterns as well. The last sample contains the basic rhythm and three patterns. Each sample is exactly one bar in length, so you can loop it until you get tired of it. These recordings were made by connecting the output signal of the sound board directly to the line input of a PC sound card. Hi Stefan, I really like the Leslie speaker sound, but can understand why it might clash with the rhythm output. 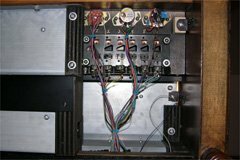 You are probably considering a separate amp and fixed speaker for the rhythm alone – that’s if you have any room left in your organ – you might have to consider a satellite speaker/amp for this. You did a lovely job modifying and adding the rhythm unit, the hybrid design was a nice job, and the physical modification looks just like a factory job, your work is very nice. We share quite a few interests, so your whole web site has many interesting things! 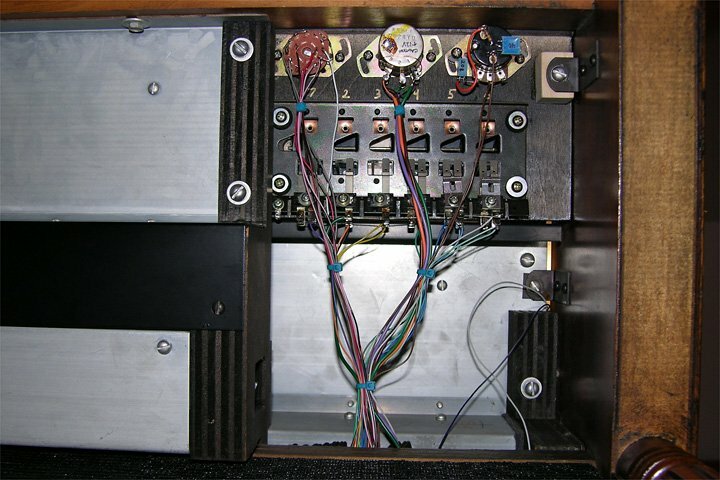 Hi Colin, since the time I wrote this article, I’ve fed the rhythm unit output to my external non-Leslie tone cabinets (see http://www.stefanv.com/electronics/hammond_window_seat.html for details). It works quite nicely, since a real percussionist wouldn’t be playing from inside the organ anyway. Andrei, a BK-20 is a purely analog organ. It does have a line output, so with the appropriate adapter, you can feed that into the line input of a PC’s sound card. Good work and a great article. I find this one and the one on the revolving speaker very useful because I have 3 old Yamahas of various models (they are available for next to nothing on ebay these days – in fact most don’t sell) and I’m trying to restore them as best I can. Electrolytics and transistors are failing faster than I can replace them! Your articles are a great source of information on organs in general and specifically the Yamaha RS board and revolving speaker. However I still have no real option but to trace the circuits and work through painstakingly with a scope to find and fix the numerous faults. 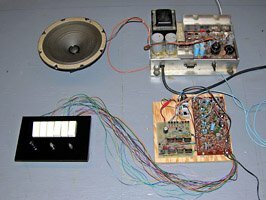 Most of the audio circuits are kind of straightforward but I still have to tackle the motor drive circuit on one of the revolving speakers. I’ll replace the electrolytics and cross my fingers! Regarding this project itself I would probably use something like the ATMega8 to drive the RS board as an alternative to TTL. I might have to do this if the rhythm pattern generator fails on one of the Yamaha, they would probably be difficult to fault-find. Hello, Ive got an identical sound board to play with. I was wondering if you had any tips to make the sounds more adjustable? There is obviously the pots on the board, but the circuits for BD congas and Tom for look almost identical, so replacing the resistors with different values for pots of a large range or something might be a good idea? And also, the sounds are triggered by S-trig correct? Mike, I’d be very interested in seeing pictures. If you e-mail them to me, I’ll add them as an addendum to this article. Hi Stefan – I will do that. I just soldered a bunch of leads coming off the bottom of the RS board and out to the pots – it’s kind of a big mess at the moment, but I’ll try to get a clear picture for you. This is my first venture in circuit modification and I’m encouraged to do more due to this going so well. I plan to mount the RS board in an old Tapco mixer case (which happened to be the donor of many of the pots) along with the pattern generator from the organ, which I need to track down. I found your site trying to figure out the power supply, but maybe a 12v DC wall wart may work??? I can possibly get you a sound sample as well. Don’t know if you’re interested in synthesizers or not but a lot of the Yamaha organs from 1977-1982 (models with “Upper Orchestra Presets”) have CS series filter and adsr circuits inside and just need pots subbed in the right places to make synths out of them. I started on this drum machine as practice for that project I would like to tackle on an E70. Sorry I never got back to you on this. Had a few problems unrelated to the mod though. I actually fried something on the RS board due to my lack of knowledge…didn’t realize the ears that hold the board in the rack are tied to ground and -12v, mounted them to the Tapco metal face plate and shorted it all out. Too bad because I had it working out of the organ off a 12v wall wart. Currently trying to see if an RS board from a D80 Yamaha will work with the DK pattern cards. I’ll keep you posted. I’m unable to look at the page you’re referring to, so I can’t really comment on what would be required to trigger his voices. Assuming they trigger on a 5V rising edge, then you can probably trigger them directly from the diodes that drive the transistors in my circuit (and omit the transistors). Love your website, especially the hammond and drum machine stuff. I was trying to trouble shoot the rhythm ace (model number ?) analog drum machine that came with my hammond T211 organ. Quite similar to this project you described. I am getting a significant 60 hum (measured with a scope) from the audio output. Checked the dc power supply, which looked fine. The hum changed with proximity of my body to the cable connecting the controller to the tone generator (the many wired cable). It makes the hum any time the unit is on sound rather than silent mode regardless of the rhythm selected. Varies with volume knob. I was thinking originally a grounding problem or proximity to some mains lines in the organ. Removed the unit from the organ and still got it, noise got louder with my hand near or around the multi wire cable. Thinking this is due to an issue with this cable – ie changing capacitance orinductance due to the mains wiring sending electromagnetic waves into the air? The long low voltage signal wires act like an antenna, changing the capacitance of the wires? Thinking of shortening the cable significantly might do it. Or am I missing something? Your original hunch of a bad ground is far more likely than the complicated scenario you have outlined. Also, are you sure the DC supply is clean? It’s probably quite old, and needs its electrolytic capacitors replaced. Your blue stripboard layout is very nice. What is the software name?